Prism Polish – 7 oz. Prism Polish has been formulated to clean, polish and protect all metals in one application. Our protective coating is designed to last 3 to 6 months. Prism Polish contains no harsh acids, caustics or abrasives; it’s safe on all metals, fiberglass, Gel-Coat, Plexiglass and painted surfaces. Prism Polish has been developed for use in the marine, aviation, automotive, motorcycle and maintenance industries. Use Prism Polish on bronze, brass, copper, stainless steel, chrome, aluminum, pewter, nickel, sterling silver, silver plate and factory blued guns. Test plated metals in an inconspicuous area before use. 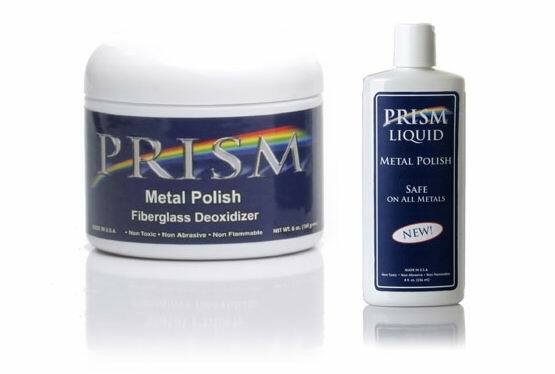 Prism Polish is excellent to clean and deoxidize fiberglass; it removes cloudiness from plexiglass, clean vinyl, eisenglass or lexan. Prism Liquid Polish was originally developed for the hospitality industry, now being used in homes across the country as an excellent polish for the stainless steel appliances: fridges, dishwashers & stoves that are in every kitchen. Prism Liquid is safe on all metals from your finest sterling silver to your brass bed & don’t forget your outdoor stainless grills, chrome, copper, nickel, pewter and much more. Safe on rifles, shotguns & handguns Too! Prism Liquid is formulated to clean, polish and protect all metals in one application. Prism Liquid is non-toxic and contains no harsh acids, caustics or abrasives; it’s safe on all metals, fiberglass, gel-coat, Plexiglas and painted surfaces. Prism Liquid Polish is easy to use for the professional cleaning application as in New York City’s Grand Central Terminal, restaurants, hotels, churches, ships & yachts all choose Prism Liquid Polish. Test plated metals in an inconspicuous area before use. To provide state of the art maintenance products for private and industrial applications.